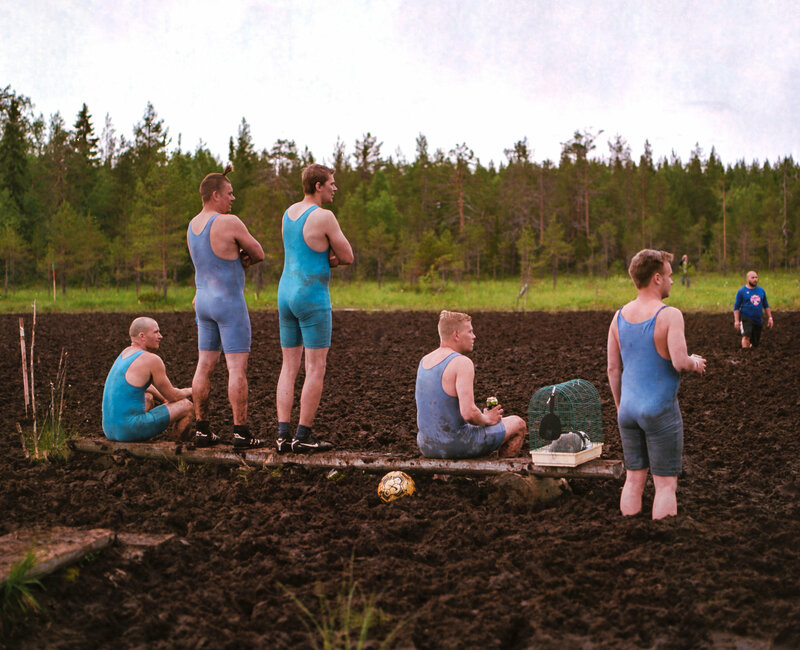 A team from Vihti, Finland, competing in the country’s 20th annual Swamp Soccer World Championships. Their mascot, a badger doll, is the one in the cage. Gotta love those Finns. They have possibly the best education system in the world and all those unusual contests like wife carrying and cellphone tossing. Long, dark winters must make for desperate ideas about how to have fun in summer. Andrew Keh writes at the New York Times, “There’s something strange going on in Finland. Over the past few decades, as it has all but disappeared from the global sports stage, this humble Nordic nation has sort of lost its sports mind. “More than 2,000 people ventured to the remote backwaters of central Finland recently for the 20th annual Swamp Soccer World Championships. If you and your spouse want to compete in the Wife Carrying World Championships, you must come to Finland. The Mobile Phone Throwing World Championships? Finland. The World Berry Picking Championship and the Air Guitar World Championships? Finland and Finland. “ ‘We have some weird hobbies,’ said Paivi Kemppainen, 26, a staff member at the swamp soccer competition and master of the understatement. “On Saturday morning … a bottle of vodka was being passed around (their preferred way, apparently, of warming up). It was about 10 o’clock. Soon it would be time for their first game of the day. They set Jetta aside and stripped off their outerwear, revealing skimpy blue wrestling singlets. “Before they treaded into the mud, they were asked a question: Why? I know that Swedes often find Finns entertaining. I do, too. I love the spirit that can make a party out of nothing. It takes a certain kind of person to get a kick out of mud. I was always impressed with a former colleague who threw herself into Tough Mudder competitions, https://toughmudder.com/. Ha! I think this all suggests that the Finns have a culture based in a wry sense of humor and fun! We could use a little of that over here! Different types of football, of course there are different records. Like the best players or top scorers.